SUMMARY: Pain referred to the ear is a well-documented phenomenon, which can be due to a multitude of disease processes. With the recent and rapid progression of CT and MR imaging technology, radiologists have played an increasing role in solving this potentially difficult diagnostic dilemma. Essentially any pathology residing within the sensory net of cranial nerves V, VII, IX, and X and the upper cervical nerves C2 and C3 can potentially cause referred otalgia. This article will attempt to outline the various sensorineural pathways that dually innervate the ear and other sites within the head and neck, as well as discuss various disease processes that are known to result in referred otalgia. Ear pain (otalgia) can be divided into 2 main categories: primary and secondary.1 Primary ear pain is an entity whereby the origin of the pain arises from the ear itself. Common disease processes resulting in primary otalgia include otomastoiditis, cholesteatoma, and foreign bodies lodged within the ear canal. In close to 50% of cases, however, the source of the pain does not reside within the ear but, rather, originates from sources distant from the ear—so called “referred otalgia” (Fig 1).1,2 The focus of our topic is the radiology of referred otalgia. Otalgia arising from head and neck sources. Essentially any pathology residing within the sensory net of cranial nerves V, VII, IX, and X and upper cervical nerves C2 and C3 can potentially cause pain referred to the ear. Reprinted with permission from the American Journal of Clinical Oncology (2003;26:e157–62). In the setting of otalgia with completely negative findings on ear examination (including an unremarkable otoscopic examination and dedicated CT of the temporal bone), it is imperative that distant sources within the head and neck be evaluated. To clinicians, this may include palpating within the patient's oral cavity or performing an indirect mirror examination or fiberoptic examination of the hypopharynx and larynx.5 If the source of the patient's pain is found, no further work-up may be necessary. However, in the cases of negative findings on physical examination, CT or MR imaging may be an excellent tool to investigate further regions of the head and neck that are not easily evaluated by physical examination.5 It is, therefore, important that radiologists are cognizant of the types and locations of relevant disease processes so that they are best equipped to aid their colleagues and patients. Primary and referred otalgia pathways of the mandibular nerve (V3). Cranial nerve V is the most frequent pathway for referred otalgia via the auriculotemporal branch of the trigeminal nerve. Reprinted with permission from the American Journal of Clinical Oncology (2003;26:e157–62). TMJ. Coronal reformatted CT scan demonstrates severe erosion and irregularity involving the head of the left condylar process. TMJ disease has been well documented to be associated with referred otalgia via the auriculotemporal and masseteric branches of V3. 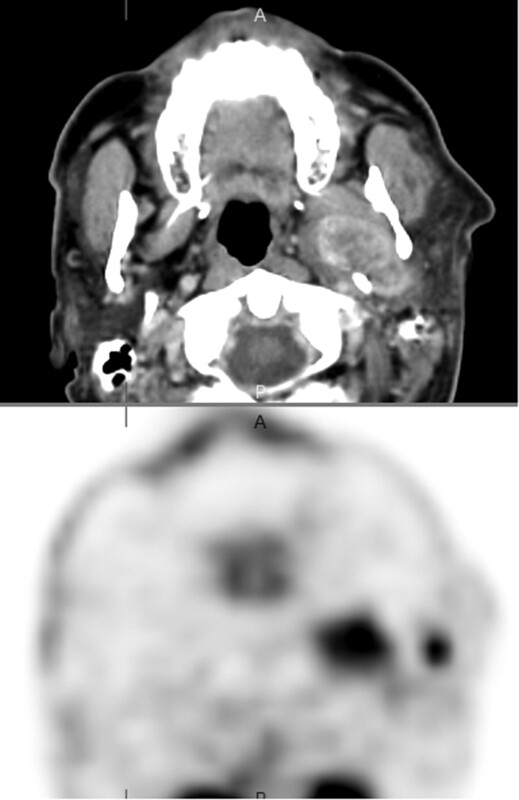 Parotid malignancy. 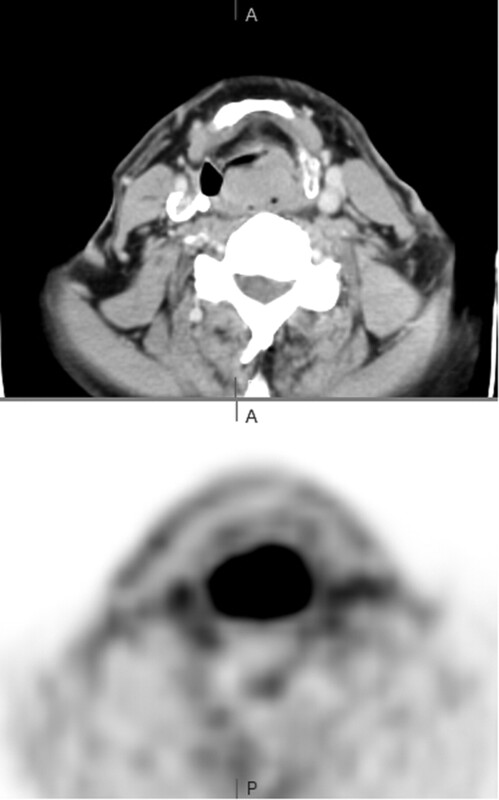 Positron-emission tomography image demonstrates abnormal hypermetabolic activity involving the left prestyloid parapharyngeal region. The corresponding anatomic images demonstrate a calcified mass within the deep lobe of the parotid gland. The parotid branches of the auriculotemporal nerve mediate referred otalgia. Primary and referred otalgia pathways of the facial nerve (VII). Cranial nerve VII produces referred otalgia via the auricular branch of the facial nerve. Bell palsy can present as ear pain, antecedent to facial paralysis. Reprinted with permission from the American Journal of Clinical Oncology (2003;26:e157–62). 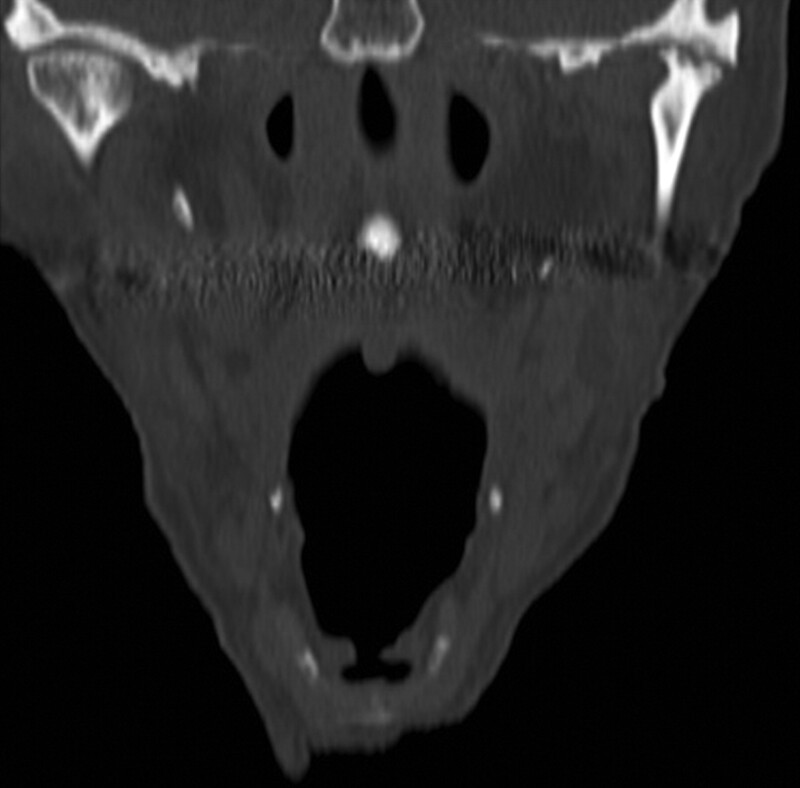 Sphenoid sinusitis. 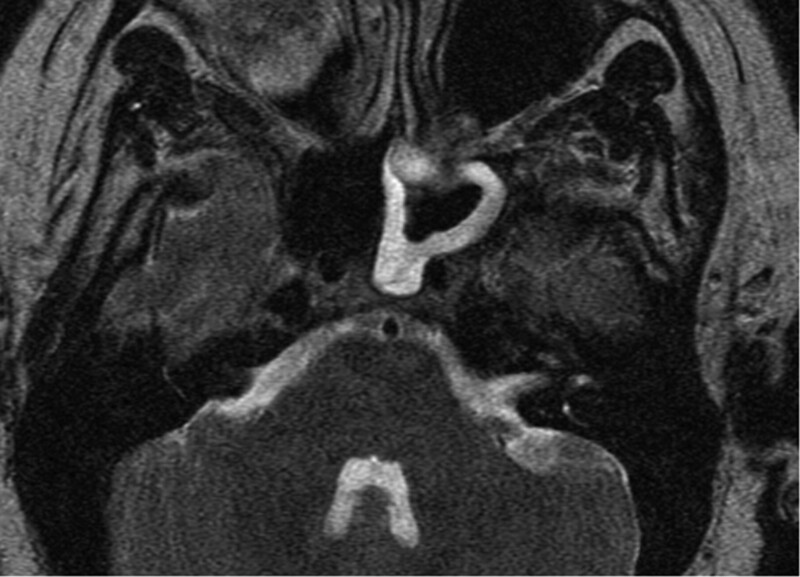 T2-weighted image demonstrates mucosal thickening in the left sphenoid sinus. The greater superficial petrosal nerve supplies afferents to this region. Nasal spur. 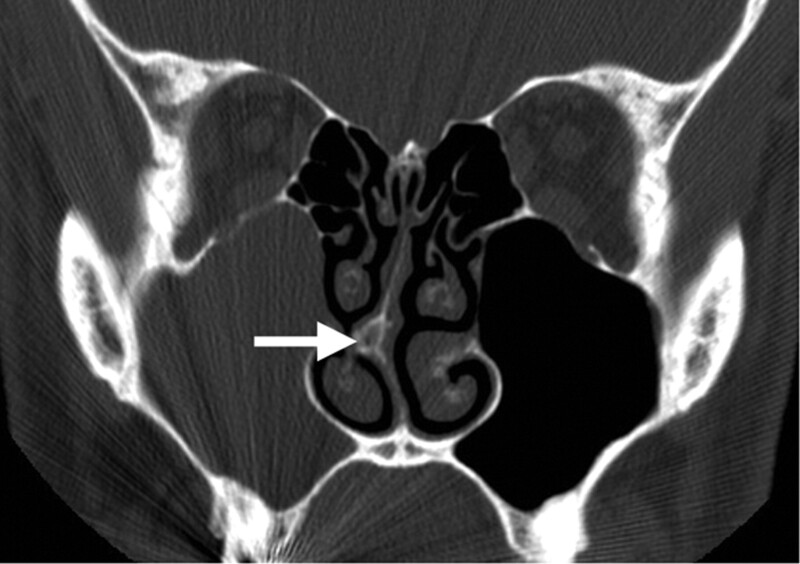 Coronal CT with bone algorithm demonstrates a nasal spur that touches the adjacent concha. Referred otalgia may be eliminated during the ENT examination via placement of a cocaine solution over the spur. Head and neck radiologists are most familiar with the areas innervated by the glossopharyngeal nerve. 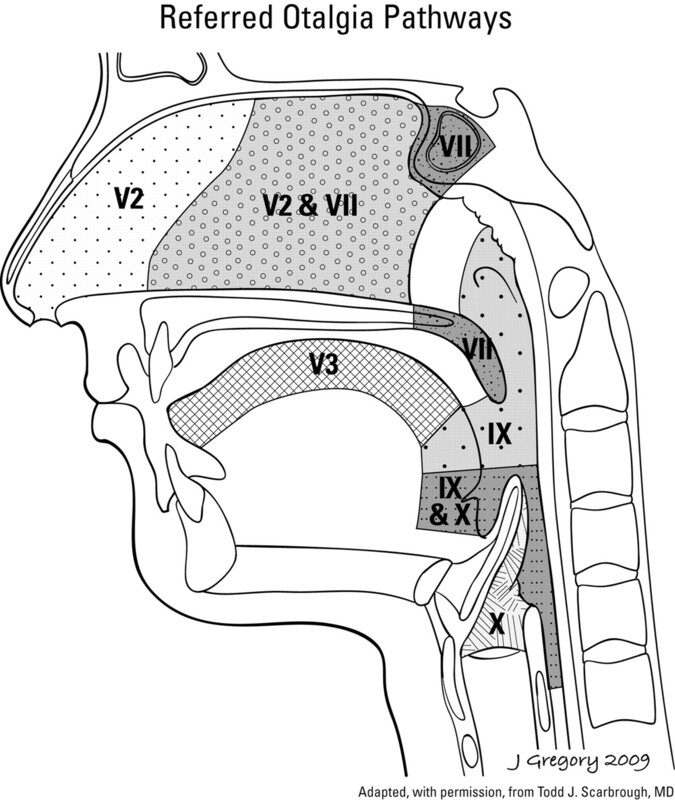 The tympanic nerve (Jacobson nerve, a branch of cranial nerve IX) directly innervates the ear but also has pharyngeal, lingual, and tonsillar branches to supply the posterior one-third portion of the tongue, tonsillar fossa/pillars, pharynx, eustachian tube,10 and parapharyngeal and retropharyngeal spaces (Fig 8).1 Any pathologic process involving the aforementioned areas can result in referred otalgia. Primary and referred otalgia pathways of the glossopharyngeal nerve (IX). Cranial nerve IX mediates otalgia via the tympanic nerve of Jacobson. Reprinted with permission from the American Journal of Clinical Oncology (2003;26:e157–62). Squamous cell carcinoma of the nasopharynx. 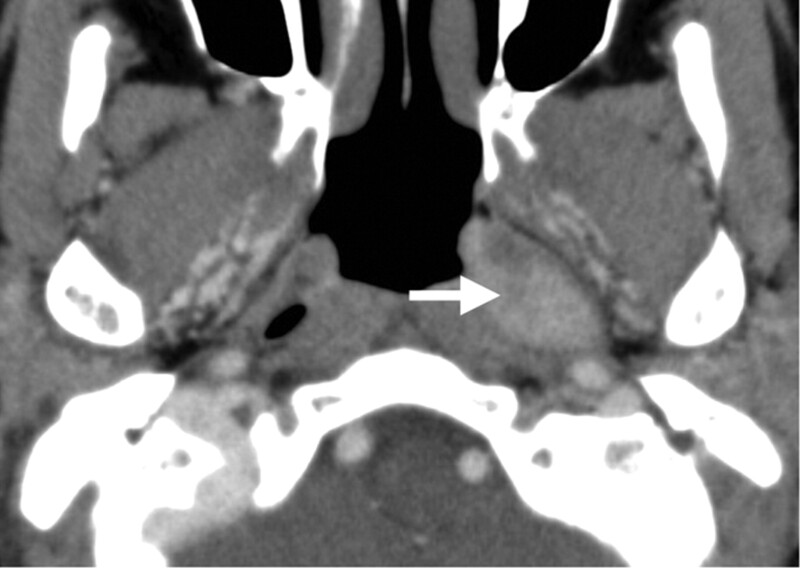 Axial CT scan with contrast demonstrates an abnormal soft-tissue mass with relatively uniform contrast enhancement filling the left lateral fossa of Rosenmueller, affecting the pharyngeal plexus of cranial nerve IX. Peritonsillar abscess. 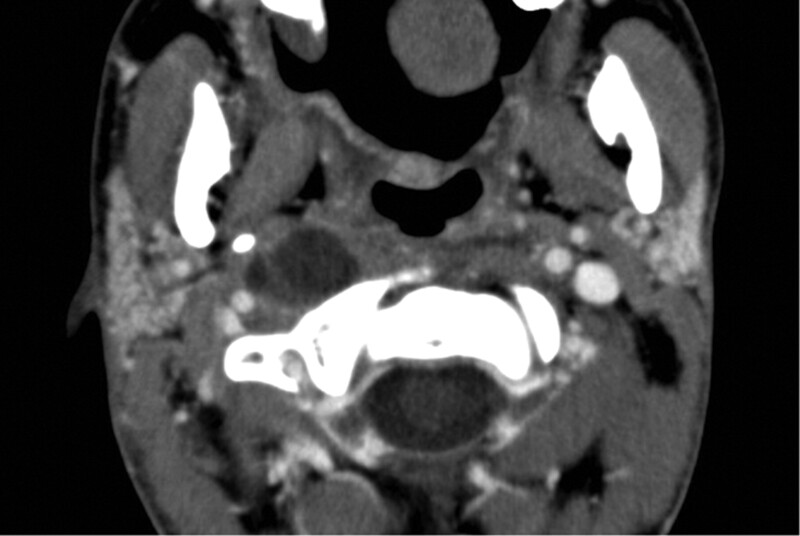 Axial CT scan with contrast demonstrates a right inferior peritonsillar abscess in association with edematous change in the adjacent right parapharyngeal space irritating the pharyngeal plexus (cranial nerve IX). Retropharyngeal adenitis. 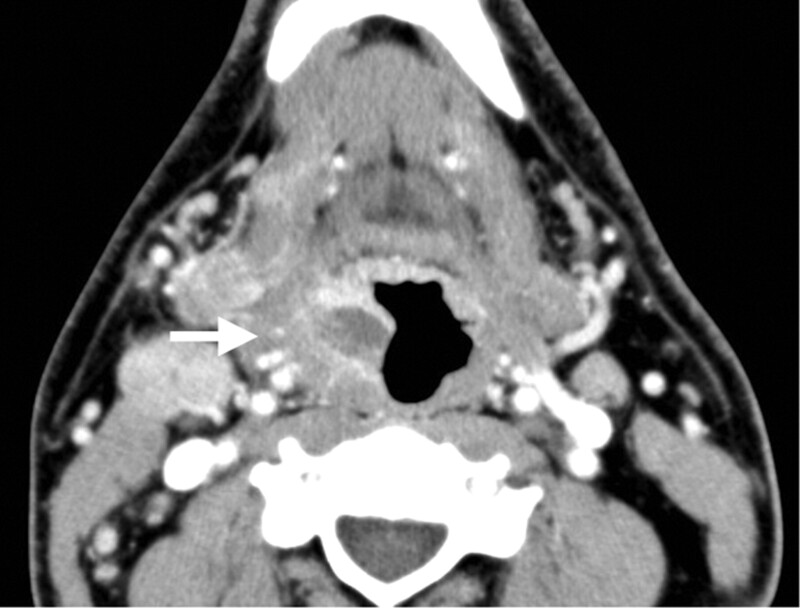 Axial CT scan demonstrates suppurative adenitis involving the right retropharyngeal space, which can affect the pharyngeal plexus and produce referred otalgia. Eagle syndrome. A 30-year-old man with otalgia. 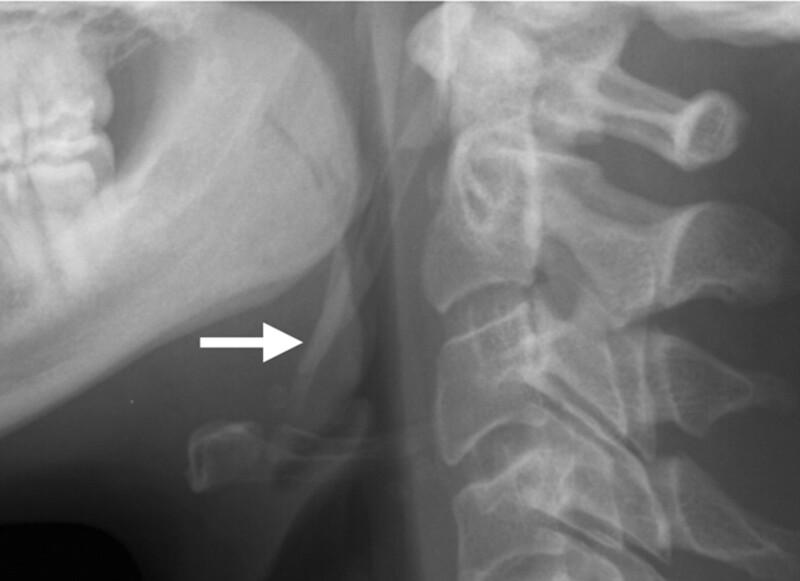 Plain film demonstrates a thickened and elongated styloid process, which can irritate the tonsillar bed via the tonsillar branch of cranial nerve IX. Patients classically have reproduction of pain on transoral palpation of the tonsils. The vagus nerve supplies the valleculae, lingual, and laryngeal surfaces of the epiglottis, supraglottic larynx, pyriform sinuses, thyroid gland, and more distant sites within the thorax, including the tracheobronchial tree and esophagus (Fig 13).12,14 The Arnold nerve directly innervates the ear, whereas the internal branch of the superior laryngeal nerve and pharyngeal branch of the vagus nerve innervate the larynx and lower pharynx respectively.12,13 The recurrent laryngeal nerve innervates the cervical esophagus and trachea, and the bronchial branch of the vagus nerve innervates the lungs and bronchi. Supraglottic squamous cell carcinoma. Positron-emission tomography/CT scan demonstrates an enhancing exophytic supraglottic mass arising from the posterior wall of the larynx. This area is innervated by the internal branch of the superior laryngeal nerve and can result in otalgia when irritated. Several case reports have documented otalgia as being the presenting symptom of lung carcinoma. Some authors have even recommended performing a chest x-ray in every patient with a long history of smoking and having atypical facial pain.31 A thorough review of the lung apices, trachea, and mediastinum is warranted on every sectional imaging study for referred otalgia. Papillary thyroid cancer. 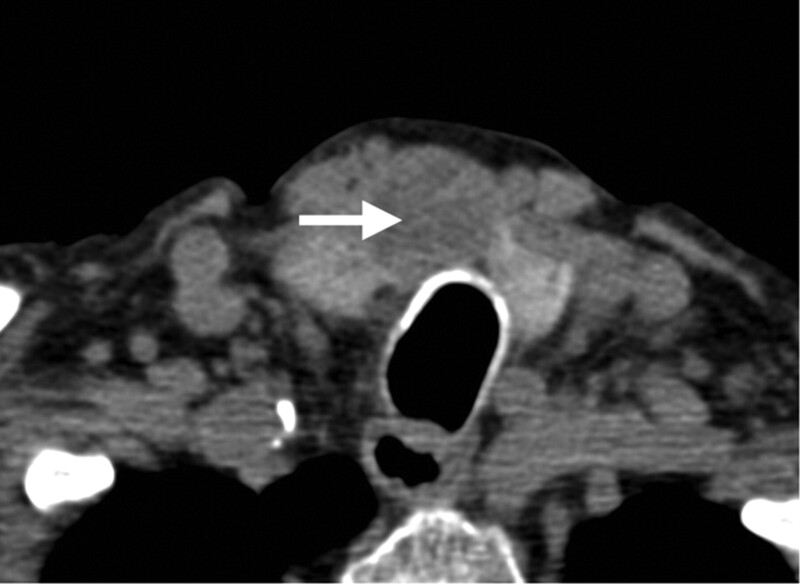 Axial CT scan demonstrates a hypoattenuated mass centered in the thyroid isthmus. Although most thyroid cancers are subclinical, some may present with pain or dysphagia. Because the sensory innervation to the thyroid gland is via the superior and recurrent laryngeal nerves, there have been documented cases of thyroid pathology manifesting as ear pain. Several neuralgias have been implicated in causing otalgia. The neuralgias are a group of diseases causing lancinating pain in the distribution of the affected nerve without producing a neurologic deficit.40,42 Once an objective neurologic deficit is encountered, the term “neuralgia” should be exchanged for “neuropathy.”40 Most sources group neuralgia into primary and secondary categories, with primary causes being idiopathic and physiologic in disturbance and secondary neuralgia arising from a distinct anatomic abnormality, such as a compressive tumor or vessel. Idiopathic neuralgia should only be considered when no organic cause for the patient's clinical symptoms can be found, at the expense of failing to treat something much more serious. Radiologists play a pivotal role in the diagnosis of neuralgia by determining whether there is an anatomic basis for the patient's symptoms. In other words, we can help determine whether the neuralgia is primary or secondary. Since the early 1900s, referred otalgia has been a well-documented phenomenon in the ear, nose, and throat (ENT) and neurosurgical literature. However, it is only in the past few decades with the recent and rapid progression of CT and MR imaging technology that head and neck radiologists have been capable of being an integral part in the team of physicians helping to solve the dilemma of referred otalgia. Essentially any pathology residing within the sensory net of cranial nerves V, VII, IX, and X and upper cervical nerves C2 and C3 can potentially cause referred otalgia. A thorough understanding of the various sensorineural pathways that dually innervate the ear and other sites in the head and neck, alongside a constant and ongoing dialogue with our clinical colleagues, will ensure that patients with referred otalgia will receive the best care possible.